With enriched domain experience and knowledge in the relevant field, we are manufacturing a wide assortment of SS Designer Pillar. The S S Master Pillars, we design and offer are widely appreciated among our clients based across the country. We use latest machines and high grade material in the production process so as to assure international quality standards. The offered range can also be provided in different grades and sizes to meet the customized demands of our clients. Backed by years of industry experience, we are engaged in offering a premium quality range of SS Master Pillar. Coated Rajwadi Railings In S.s. Application: Houses, Hotels, Restaurants, Resorts, etc. 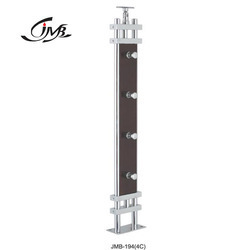 We are offering Fancy Master Pillar to our clients.